There is a Barnes & Noble superstore six or seven miles from my house. It’s right next to the Cheesecake Factory, so we visit it often. We visited it tonight, and I was absolutely appalled to see that the Civil War section has now shrunk to two shelves, or about 35 titles. That’s it. What was there was an odd mix of new books, like Jeff Wert’s bio of Jeb Stuart and Benson Bobrick’s new bio of George H. Thomas, and older books, including some Bruce Catton stuff. With only about 35 titles to choose from, the selection was obviously extremely limited. I understand that it’s a business, and I likewise understand that they’re going to carry what sells, but the Civil War section of this store gets smaller and smaller every time I go in there. With the sesquicentennial of the war coming up in 18 months, I’m just horrified that (a) Barnes & Noble devotes absolutely no shelf space to the Civil War and (b) that my fellow Ohioans are so apathetic about history that there’s not enough demand for Civil War books at that humungous store to warrant more than 35 titles in stock. By comparison, there were about 35 poorly written idiotic vampire titles aimed at tween and teenage girls who think that sort of thing is neat and romantic. To me, that speaks volumes about where our priorities are as a society. I’m appalled by this, and I have no idea what can be done to get Barnes & Noble to increase their selection of Civil War titles, but if there is anything that can be done, I will gladly do it. Rob Wick, if you read this and have any suggestions, please pass them along, because I’m absolutely horrified by what I saw tonight. I really think it depends on the individual store and its location. My home and local B&N is about 2 hours north of Gettysburg. The Civil War is big in PA.
At this store, there are about 12 shelves of Civil War books and another three in the bargain section. Very good selection. Plus, I’m pretty sure I saw “One Continuous Fight” the last time I was there. The store has a HUGE history/biography section. Last time I was there I got Bearrs’ “Fields of Honor” and Ferguson’s “Land of Lincoln” for $6 each! I live just outside of Richmond and B&N has really started to carry less and less Civil War books. I can remember when some of there stores carried multiple shelves but I also have noticed that it is now down to 1 to 2 sections of shelves. I can remember some of them carrying multiple rows of shelves in the past. Some of the bookstores near Fredericksbug have great selections. I agree that it is an appalling statement of where we are as a society. Hello! Admire your work, have bought alot of your books but none at Barnes&Noble. I’ve noticed the same trend at B&N’s in the Chicago area, and I must agree. There is assuredly alot of crap marketed at these stores, but what bothers me is what appears in their history section: heavy on knight’s templars treasure, the hidden secret of the pyramids, etc. The Civil War sections sometimes carries secret treasure of the CSA, and titles of that nature. If B&N wants to sell this crap, set up a crap section for it, keep it away from actual history. First, given the literacy of the populace at large, it’s amazing that we still HAVE “book stores”. Our local B&N has a couple of aisles of shelves on “history” as well as shelves of “bargain books”, areas containing newly released works which often contain books that could fall into the “civil war” category and a lot of other books – mystery, fiction, the arts etc. And, of course, there is the “coffee bar” which serves sandwiches, sweets and so many varieties and versions of coffee that it can bring forth a mental seizure trying to determine what one actually wants before the customers in the line begin to grumble. But the truth is, the interests of the buying public determines what the store carries although each store will “get something” for the purchaser when asked to do so – or at least I have found that to be the case. On-line purchases seem to be the most popular venue for obtaining books. Yes, there is a wait, but if one has esoteric interests, the wait is just as long when you order from the local store and it’s far less of a hassle to sit down in front of the computer than haul oneself off to the bookstore. And, of course, the desired tome is frequently available in a used condition for much less than the price when new – and often in pretty much the same condition. I fear that the changing nature of society will mean that a lot of interesting commercial enterprises, not just bookstores, are heading for extinction. B&N is devoting shelf-facing for that which will sell. What we are bemoaning here is that CW history does not sell. A sign of the times and how few of us are left. But when we want a book, we look to Amazon or ABE or some other purveyor. Small wonder that B&N doesn’t offer a large selection. I have taken my 1,000 page analysis of Grant’s strategic vision, and have converted it into a book about teenage vampires of the Civil War. Who sparkle. That aughta get some shelf space. The Barnes and Noble that I frequent still has about 6 shelves devoted to the Civil War. 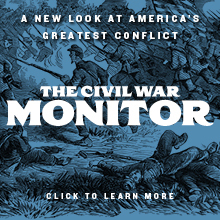 However, I think that we have to face the fact that overall interest in the Civil War has dropped from the numbers that we were seeing after Ken Burn’s documentary. I generally agree with Ole and Stan. The in-store CW stock at B&N’s here in SE Michigan is dismal as well. Meanwhile, Borders, which is headquartered in Ann Arbor, has just posted its 11th quarterly decline and some surmise that the chain is on the ropes. The upcoming sesquicentennial could be an excellent time to rekindle public interest, however I don’t see it happening, so far. I have noticed the same here in the Pittsburgh area. The Borders that I usually shop at in Monroeville has actually wiped out about half of their entire history section. They do have signs up saying that they are in the process of reorganizing, which I hope is true, but time will tell. As for Barnes and Noble, I have noticed that their Civil War section has gotten smaller over the last year and that every store has basically the same titles (most of which I already own). The sad part is that I actually see people looking for books in the history section, but not making purchases (perhaps due to a lack of titles available). I live very close to a Borders book store. I frequent it often. While not as bad as the situation with this B & N, they have gone from two full shelf sections to a little over one. 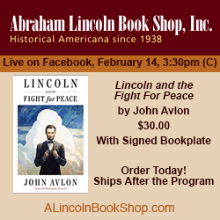 While I understand their need to turn their inventory regularly, they still need to keep a large enough selection of books for Civil War buffs and those just starting to explore the Civil War. This is precisely why I support Amazon.com and Morningside Books. They both keep large selections of titles – including those that are hard to find – and in many cases especially with Morningside, books that are no longer in print. I believe we need to support those sellers that keep books that don’t sell as quickly. Well if it is any consolation, the B&N stores in Northern Virginia seemed well stocked. Normally there are at least a couple copies of a “Wittenberg” title, if not representatives of two titles. Perhaps the store managers are working on a nich market – spouses who are browsing while their husbands are off visiting the battlefield? I agree with other comments ref. the survival of the brick and mortar stores. I don’t see them around another 10 years or so. Or what is left will be radically different. Likely more coffee shop than bookstore, linked to electronic versions of the book. The “rekindling” of the book-store will occur as things like the Kindle gain more acceptance. My impression from frequent visits to the big bookstores in Knoxville, TN is that B&N stores don’t carry as many history or ACW titles as the other stores. The history selection at the local Borders is spectacular, with whole bookcases full of ACW titles. I’d say there are about as many ACW books on sale there as there are books on the whole range of European history. Same thing at the big used bookstore in West Knox, which has a section of ACW books that rivals the general US History section. Down the road, by contrast, B&N’s history section is much smaller, and ACW titles constitute a much smaller percentage of what history titles they do have. Maybe it’s some B&N thing? attb Scott: There was a 1998 made-for-TV movie that attributed Grant’s victory at Champion’s Hill to voodoo. This feature was also a loose adaptation of “The Tempest” and was written and directed by Peter Fonda. It wasn’t bad, as far as zombie-Vicksburg Campaign-Shakespeare films go. The B&N in Jacksonville, NC carries a pretty good stock of Civil War books, but has a much larger section on modern military history; after all, the town is home to the largest Marine Corps base on the east coast. I guess that lends itself to our B&N having a larger history section, and particularly more military history. However (and as an author you probably don’t like to hear this) when I buy books I normally don’t buy from the store. I usually buy used copies from Amazon or ABE because I can get them cheaper – sometimes A LOT cheaper. My wife and I are both historians employed by the state, so we can’t afford to buy a lot at B&N. Every holiday that comes around, I tell folks to buy me B&N gift cards, though! I wish we had a B&N, but at the local Books-a-Million the Civil War section has grown smaller by a third over the last two years, and a lot of that is schlock. Ultimately in the chains, that ultimately has to have more to do with what sells than any local manager’s preference. A few years ago, the Society of Military Historians annual meeting sponsored a panel called “Is World War II the New Civil War?” Based on the growing size of the WW2 section locally, I’m starting to think that maybe it is. Civil War history has always waxed and waned in interest, and honestly we seem to be entering a waning period two decades after Burnsmania and a few years after “Band of Brothers.” Park attendance is down a lot of places, and round tables are aging. Maybe the 150th will turn that around, but I haven’t seen many positive signs yet. I am at a point where I have little to add to this. While I have no hard numbers, I can say that our sales haven’t gone down as much as other retailers, but I would say most of those sales are the Twilight books and other crap that is hot now. However, our store has also sold six copies of Michael Burlingame’s two-volume biography of Lincoln (five at full price, one at 30 percent off thanks to my employee discount). We are getting most of the new titles coming out but our backlist is stuck in the same rut. I have the authority to bring in titles that our buyers seem to miss but as I’ve said before, they are usually coded for return very quickly. The only thing I can suggest to anyone is to ask for the store manager and give them SPECIFIC titles you would like to see in the store. Saying to them that you need to expand your Civil War section will fall on deaf ears. But it also needs to be done by several people because if a store gets one person asking about a book the bookseller will suggest ordering it, because the company discourages speculative ordering by stores as it adds to the cost of doing business. Truthfully I don’t see much that can be done on a large scale. You need to keep going to your store and keep asking them why they don’t have a specific book in stock and that you think they could expand their sales if they kept the title in stock. Some managers will listen, others won’t. Barnes and Noble remains the largest bookseller in the world, but we are also in the business of selling discount cards (drummed into our heads at every store meeting all the time), collecting e-mail addresses (so we can send coupons and try to bring more people into the store to buy member’s cards) and selling gift products and coffee (because too many people aren’t deciding to buy books instead of groceries or paying the bills). What I’m trying to sarcastically say is that most managers are under pressure to sell several things other than books that make the store far more money, so while they might be polite and say they will do all they can to satisfy you, bringing in books on the possibility that they might sell someday down the road is unlikely to happen. Right now, vampires sell to a far larger audience than history titles do. More’s the pity. Here in Georgia, it varies. Generally, the Civil War section of B & Ns shrink each year. The two or three near where I live have (at most) a single case (usually only two or three shelves of a single case) and most of the available titles right now are Lincoln books (good books, I’m sure, but not really my cup of tea). I can’t remember the last time I bought a CW book at a B & N (although I still by CWTIs from them). As for Borders, they vary from location to location. The Borders in Kennesaw (not far from the battlefield), has about one-and-a-half cases of CW titles, while, perversely, the Borders over in Roswell, far from the battlefield, has three-and-a-half cases. It just depends. It seems, though, that Borders are harder to come by, whereas B & Ns are like Starbucks—they’re freaking EVERYWHERE. You’ll be pleased to know, though, Eric, that the Borders in Roswell DOES have a copy of “One Continuous Fight”. It’s been sitting there for several months now, and I’ve been tempted to buy it (funds are kinda low right now, though). They also at one time had a copy of your “Rush’s Lancers”. Never really liked B&N as its history title selection was always inferior to Borders, and it was always a tad more expensive. But I have noticed the trend you mention at both stores, and have to believe that it is due in large part to internet sales. Both companies took off in the late 80s – early 90s when internet sales were low, and it made sense from a marketing standpoint to have a broad assortment of titles on your shelf that other book stores did not carry. However, even B&N and Borders did not carry everything, and I have recent memories of ordering books at Borders and waiting a month to pick them up. Now, while I still like leafing through a book before making a large purchase, I do most of my shopping online. If I want to know more about a book before buying it, I can go to a book review blog, and in many instances, actually see the table of contents and a few pages of text. If I want to peruse new books, I go to Amazon, type in a topic of interest, and sort by date of publication. When I order a book, it comes directly to my mailbox, sometimes in less than a week. What’s more, with services like Bookfinder4U, I can search multiple bookstores, and set an alert when the price falls within the range I can afford, which is particularly useful for out of print books or books that I would like to buy at the right price, but are not on my “must have” list. Thus, I would estimate that, of the 50 – 75 books I purchase a year, no more than 5 are purchased at an actual bookstore. If this represents the typical history buff, I can see why B&N and Borders are reducing their history shelves. If there average customer is there to drink a latte and pick up a book on the historical topic “du jour,” why clutter your shelves with serious history? Take a close look at the overall inventory at B&N and Borders. If you have paid attention over the last 10 months, the number of books faced out compared to spined has dramatically increased indicating a large reduction in inventory. That’s no excuse for not carrying a reasonable selection of classic and newly published books in any section. But economic times are hard and cuts have to be made. Actually, BN has a policy in stores that if you have four or more copies of a title, it must be faced out. Can’t speak for Borders though. What to do? 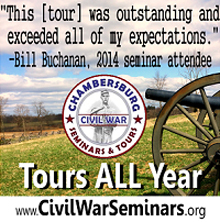 First, there needs to be an interest in Civil War history. I think it has to start with the kids. If you surveyed teachers about their interest in the Civil War, and how much time they actually spend on it in the classroom, you would probably find not much interest and not much time. Since schools are hurting, what about giving back to the community by coming up with an engaging presentation about some of the people you write about? You are obviously passionate about Civil War history, and I am sure that would come through and maybe get some of the students excited about learning more. It might even get some of the teachers motivated to learn more and teach it! Imagine if a whole group of Civil War authors would do this. What if it got students interested in doing Civil War related projects at some of the historical battlefields? Eventually, you just might get a new generation interested enough that Barnes & Noble would find it profitable to expand their Civil War section once again.